Six months after a devastating deluge washed away thousands of hectares of land parcels---under cultivation of all kinds of agriculture crops including paddy and banana, vegetables and plantations crops like coffee, cocoa, coconut, tea, rubber, cardamom, pepper and other spices---that ruined the life and livelihood of thousands of farmers, Kerala’s agriculture sector is now on a road to remarkable recovery. “The floods brought damage to the agriculture sector was unfathomable. Yet, a speedy recovery was possible only because of our increased focus on organic farming and commitment towards the conservation of indigenous seeds,’’ said Chandu, an organic farmer from Mananthawady of Wynad district. Fair Trade Alliance Kerala (FTAK), a farmer-led moment played an extremely critical role in boosting the fallen morale of the farming community, especially during these tough times. FTAK was formed a decade ago to give farmers access to global markets, improve their income from farm produce, to fight against falling prices of food grains, spices and agricultural commodities including coconuts and also to save them from growing indebtedness which led to a spate of farmer suicides. 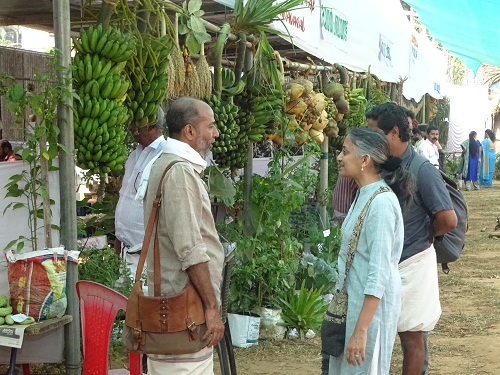 A five-day agro seed fest organised by Fair Trade Alliance Kerala brought together farmers and friends from all over the country and abroad to Wayanad. To celebrate the post floods recovery of the state’s agro sector, this edition of the fest was called: The Seeds of Survival. Addressing a large audience of farming community, Thomas Kalappura, a farmer also secretary of FTAK said, farmers are often advised by politicians and policy makers to produce at the lowest cost and also sell at the lowest cost. In the process majority of farmers don’t even recover the cost of production. FTAK came as a huge respite to farmers and through its network farmers in the state have access to domestic and global markets. Interestingly, in a goodwill gesture global customers---to whom farmers in Kerala sell their produce through FTAK---from Switzerland, UK, Germany, France and USA have contributed close a Rs 1 crore to the farming community to rebuild farms that were destroyed in floods and to revive farming activities. ``It is unfortunate that farming has reduced to a topic of mere profit and loss in India. Farming is critical for the survival of man, animals, birds and the entire ecosystem. I had the privilege to represent India in a recently concluded farmer conference in Brazil which brought together a large number agriculturists from 60 countries,’’ added Raman. Celin Manuel, a successful organic farmer said, home farming segment has been growing very rapidly in Kerala with each household showing interest in growing their own vegetables and at least some variety of fruits. ``This wave is primarily spearheaded by women and in the recent years a large number of women have entered into mainstream farming in the state,’’ she added.